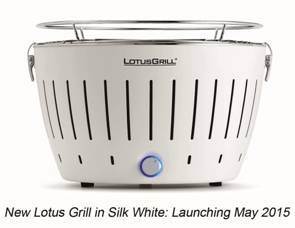 The company behind the Award-Winning Lotus Grill is proud to announce exciting new launches for 2015, including the new Lotus MiniGrill and the launch of the original Lotus Grill in Silk White. 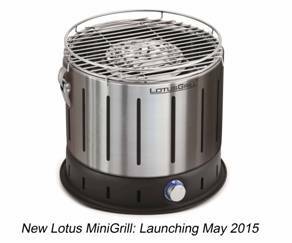 With all the same features as the original Lotus Grill, the new MiniGrill is smaller, lighter, and features a removable grill plate that converts it into a handy camping stove. Made of Stainless Steel and measuring 240mm (d) x 225mm (h), the MiniGrill is compact in design and weighs just 2kg (it’s bigger brother weighs under 4kg), making it the perfect travelling companion. Ready to cook 3-4 minutes from lighting,undoubtedly the most amazing feature of the Lotus is speed! This is achieved by the patented ‘bellows’ system; an adjustable fan blows air directly onto the charcoal to create rapid high heat, and the desired cooking temperature much faster. German-designed and engineered, Lotus Grills use 90% less charcoal to cook the perfect meal. With a built-in battery-operated fan, there’ll be no nasty fumes or smoke. Lotus provides a healthy, low fat & calorie‐conscious method of cooking. Excess fat and oil drips into the removable catching tray and not back into your food. And there is no need to add oil, as the grill reduces food sticking to it. Even in the absence of smoke, you still get that delicious bbq flavour, as natural hardwood charcoal emit these flavours through invisible safe gases. The only difference being you don’t ingest carcinogens and other harmful chemicals present in traditional BBQ smoke. The Lotus Grill has been designed with safety in mind. The temperature is controlled by adjusting the battery-operated fan and the double walled construction ensures the outer frame and base never gets hot, making it safe for use around children. The optional pizza stone and grill hood allows the Lotus Grill to be used as a pizza oven too! 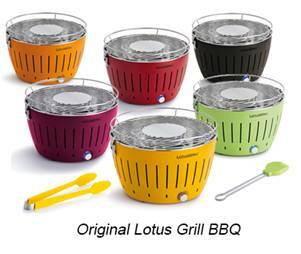 Best of all, Lotus Grill is dishwasher safe – meaning no messy clean up after dinner! At home, on the beach, boat or camping, Lotus provides the perfect summer BBQ. After cooking you can be packed up in minutes with the simple dismantle and coal extinguish process. And with the included travel bag, you can pack everything you need to save time and hassle. 1. Lower the temperature on your gas grill to prevent meat from burning and reduce the formation of carcinogenic compounds. A barbecue that has a temperature control dial will assist with this. 2. Marinate your meat to create a barrier between meat and the formation of HCAs. 3. Use a smokeless BBQ like the Lotus Grill, that has a built-in battery powered fan to stop the BBQ from smoking and prevent carcinogens from being inhaled. 4. Switch to Seafood. Seafood typically forms less HCAs than meat and requires a shorter cooking time – reducing exposure to flames on the grill. 5. Opt for leaner meats and trim any fat before grilling to reduce dripping and flame flare-ups. 6. Cut down on grill time by oven roasting or pan-searing, or choose smaller portions like kebabs that require less grilling. 8. Clean your grill after each use to avoid transferring leftover chemicals to your next meal. 10. If you do nothing else, pick off the burnt bits before eating. « Smoothpack Station To Go Bananas For!